Nothing fancy or very original here. But it’s cheap, tasty and healthy! All you need are some tortillas for the wrap and some veggies for the filling. 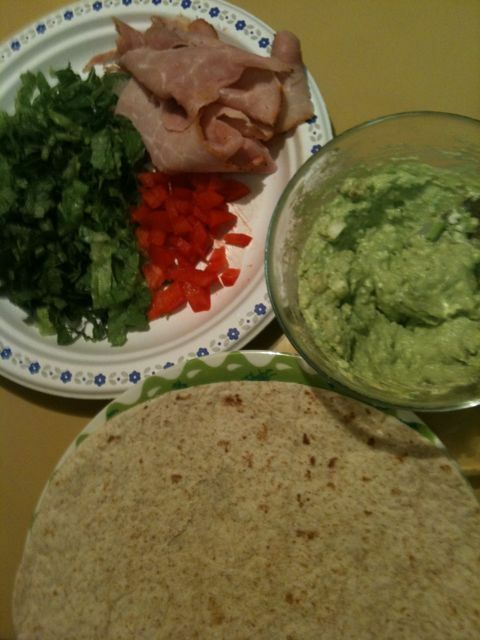 You’ll need 1 pack of tortillas (try the small ones, 110 calories each from Superstore), 2-3 lettuce leaves, 1/4 red pepper, 1/2 avocado, 1-2 green onions, feta cheese and, if you’re a meat lover, any deli cold cuts. 1. Cut avocado in half, place half (with seed inside)in a plastic bag and refrigerate. Scoop the other half and mix with a bit of feta cheese. 2. Cut green onion. Add to avocado mix. Set aside. 3. Prepare lettuce and red pepper by cutting them into very small pieces. 4. Put one tortilla on a plate and spread some avocado mix. Add some lettuce, pepper and meat. Then wrap and use two toothpicks to hold it in place.